There are thousands of hosts registered to Myfreecams.com. You will always find someone to suit your mood and taste. You can narrow your search down according to your preferences at the time of log in. There is never a shortage of stunning babes online who will welcome you into their rooms for a live chat of perfect pleasure. Myfreecams.com can remain totally free for you. That’s because the site makes it easy to take advantage of public chats, where tipping the model is totally optional and private chats are where you pay specific pre-arranged amounts. Most of the models turn the public chats into a game, thus encouraging members to buy tokens to participate. This is where the fun begins! You can choose to remain a non-paying guest in the chat room or you can participate and buy tokens. You aren’t charged until you by tokens, of course. There is no recurring billing on credit card statements. You are charged once according to your purchase. The price of the Tokens is cheaper if you buy a bigger quantity and can be used to tip models for Group Shows, Spy Shows and Private shows. Tipping is encouraged and the models frequently set up tip goals for different activities or bonuses, so have your tokens ready when you join a chat! Myfreecams doesn’t offer coupon codes, gift codes and they don’t send emails with promotions. They do offer a small discount for each token which increases with the amount of tokens you purchase (see above). Reward Points are also given for purchased tokens, which can be used on the site in various ways. There is no special tier of membership on Myfreecams.com. There is a ‘basic’ free member option and a ‘premium’ member option. Basic Membership offers free lifetime membership and free site features. You are automatically bumped up to Premium Membership when you start paying for tokens. You status as ‘Premium Member’ is a lifetime status once you have it! There is no need to purchase additional tokens if you prefer not to. Premium Membership will give you immediate and unlimited access to every feature offered on myfreecams.com. Chat in all the rooms and exchange private messages with the models. You will have the option to use your webcam for the models and other members to see you and you’ll have unrestricted and unlimited access to the site. You have the option to participate in various groups and private 1-on-1 shows when you purchase tokens. Some models block guests and Basic Members from their chat rooms until they become Premium members. All private shows that have been paid for by you are recorded and saved in your Archive. They are available for you to watch over and over again, forever. In addition. Premium Members get access to the Private Gallery, which gives the options to view any photographs of any model. The video chat features allow you to change the following: mute, volume, resize the video, shortcut to the models’ profile, the option to send a private message, choose to go private/to a show, etc. To get more information about the models, all you have to do is go into their profile by clicking their picture and choosing the ‘Profile’ option. Once there you will be able to see a general description of the model, a little about themselves, their wishlists, photos, videos and more. Each model has complete control over the design of their profile which shows something of their character too. The profiles are always fun to check out as you get to ‘meet’ the model before you start to chat. Myfreecams.com isn’t known for its design. The layout is kept simple so that it’s easy to find the perfect model for your mood and taste. All models who are currently on line will show on the homepage and all you need to do is click on their picture to enter their chatroom/profile or menu – simple! On the right of the home page, you can edit/update your account and personal options easily. Here you will also be able to find the ‘Most Popular Rooms’, ‘Miss Myfreecams’ best models and more to make your Myfreecams easier and more convenient to use.If you are a Premium Member, this is where you’ll find ‘The Lounge’, ‘Archives’, ‘Private Gallery’ and additional special features to check out. The search options are quite advanced on Myfreecams. It’s easy to find a specific model by name, kink, type, look etc. Even one word will get matches for you. There is an option to check out all the new models on the site, or models according to region, favorites, group or private chats and more. You can also hide models according to geographic areas too! These personal preferences can be set via ‘Personal Options’ in the Menu. Customer Service at Myfreecams is user friendly. All you have to do is send a message through the form provided on the site, or you have the option to send an email. This information can be found by clicking the ‘Contact Us’ link at the top of the page. Make sure you check out the FAQs before sending an email. If you don’t find an answer to your question in the FAQs, click the ‘Customer Support’ and then ‘Contact Form’ and this will direct you to the information you need. Myfreecams is in English only. 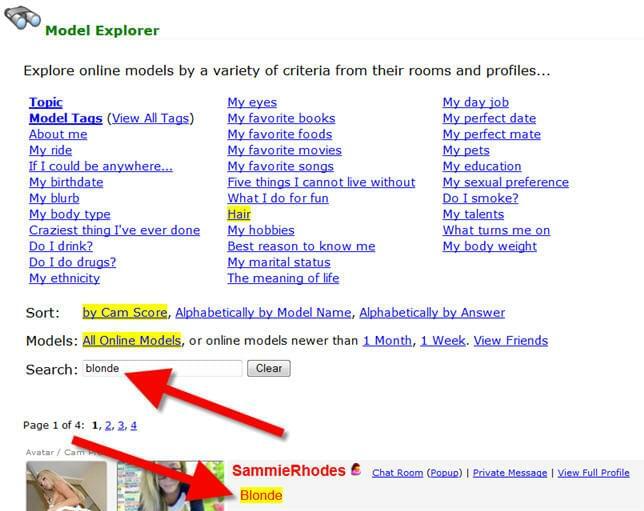 Navigation on Myfreecams.com is easy, making it simple to find the model of your choice on site. The mobile option is great and allows you to use the site anywhere and whenever you want. The design is very amateur-ish. There are no special discounts/offers – even though you can have fun for FREE! Myfreecams.com is not the best live adult chat site available, but it certainly is one of the biggest players in the webcam industry. Still, there is lots of excitement and variety with chat options.